Hisense, an official sponsor of the 2018 FIFA World CupTM, launched the new 80-inch L5 laser TV in Beijing on May 17. With highly affordable pricing, the new product is well within the reach of families with modest incomes. With the World Cup just around the corner, the revolution of the home theater in the Chinese living room has officially been launched. Technology can be life-changing. To date, the popularity of laser televisions was hobbled by two drawbacks, the lack of brightness in the image and the extravagant price. The newly launched L5 laser TV solved these two pain points. The model comes with 400 nit brightness, a substantial increase over all existing laser models, as well as a new generation custom-made Danish DNP high gain anti-light hard screen, enabling a clear picture display no matter how bright the surrounding light. As the centerpiece of a home theater, the super large screen can be viewed comfortably without needing to draw the curtains or close the shutters. As the TV is powered by a reflective light source which is comfortable to the eyes rather than dazzling, despite the 80-inch height, the screen can be viewed comfortably even when sitting as close as 3 meters (approx. 10 ft.), greatly reducing the amount of living space that would need to be set aside as a viewing area for the home theater. The second barrier to laser TV ownership has been done away with: a price tag of 19,999 yuan (approx. 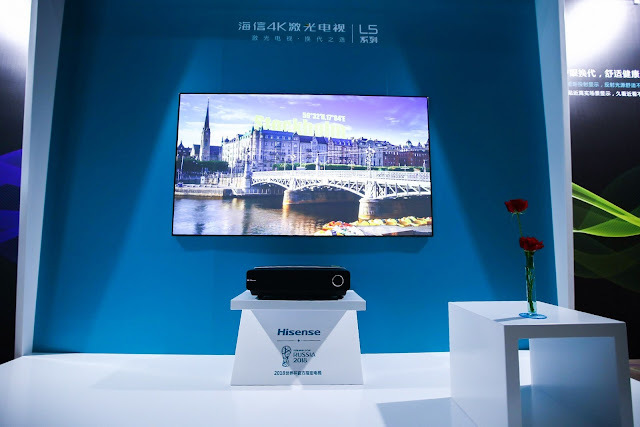 US$3,140) allows the laser model to become a "successor of first choice" and augurs Hisense's comprehensive participation in the large screen television market.